WiFi password revealer is a small program which will show you all stored passwords to your wireless (WiFi) network(s). Each time you connect to a wireless network using a password - Windows OS encrypts and stores it in the system. This program (WiFi password revealer) will find, decrypt and show you all your WiFi passwords, whenever it is your home wireless network with WPA / WPA2 encryption or WEP network in a coffee-shop. 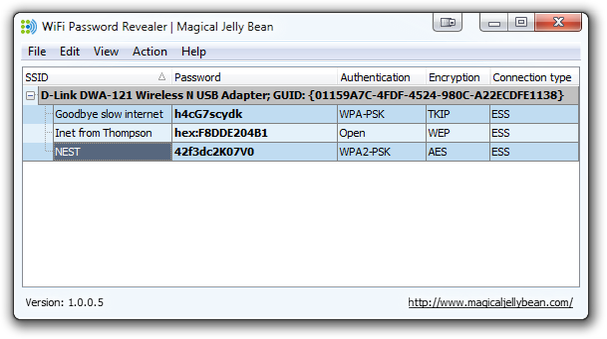 WiFi password revealer can recover WiFi passwords from on Windows XP, Windows Vista, 7 and 8. IE Asterisk Password Uncover allows you to view passwords hidden with asterisks in password fields in web pages and ActiveX controls. Comes in handy when you have forgotten your passwords. SpotMSN is messenger password recovery software for recovering lost or forgotten passwords for MSN messenger, Windows Live Messenger 8 and Windows Messenger accounts. SpotMSN is MSN password finder that instantly decrypts MSN Messenger passwords. Weeny Password Recovery is a small program that lets you see the actual password behind the asterisks. Password Manager XP is a program that will help you systematize secret information. You can forget about all your headaches caused by loss of passwords, access codes and other sensitive information.